Lots of drama and controversies in store for the viewers in the coming days. Stay tuned for the updates on #BB7. The journey of Bigg Boss has started and this time it’s Jannat VS Jahannum. Gauhar nominates Ratan (finds her unhygienic) and Pratyusha (for not being amiable). Isn’t the teary breakdown of Anita Advani a bit too much? Do the makers need this drama for higher TRPs? Kushal (who tries to correct Bigg Boss’ pronunciation), Elle, Pratyusha, Hazel and Ratan get nominated for week 1. Andy performs to 'Dil Cheez Kya Hai' and it is torturous. He killed Rekha's iconic song. While Kushal is addicted to alochol, Tanisha is self-restraining. Discussions on nominations ‘prakriya’kick off. Things are heating up in the Bigg Boss house. Pratyusha and Gauhar in a tiff? Does Gauhar have a condescending attitude towards TV artists? If so, she needs to be reminded of the fact that she has been part of two reality shows before she accepted Bigg Boss offer! And her sister Nigaar Khan too belongs to TV! So why that patronizing behaviour? Is Gauhar’s clarification convincing? Was Pratyusha overreacting? Well, we liked their petty quarrel. Day 1 offers what the show is all about - suspense, thrill, flare-ups, irritation, groupism. The first task given by Bigg Boss is taking a toll on the contestants because these celebrities are not used to such type of physical pain. They might have been hitting the gym regularly but this time of condition is entirely new for them. Very soon, they will be seen fighting each other on petty issues. Armaan Kohli is currently taking the charge of the situation but others also need to step up and take responsibility. Pratyusha's strategy is also pretty clear but this may hamper her good girl image. Watch out for today's episode as Anita Advani opens up about her relationship with late actor Rajesh Khanna. I don't think Gauhar was wrong on her part. She did over stretch it but she had valid points to get upset, no? Gauhar finds the washroom in Jahannum unflattering! What was she expecting in hell? Bathroom with a shower, bath tub/whirlpool tub? Armaan couldn't contain his excitement on entering Jannat. Isn't Armaan experiencing Jahanum in Jannat (doesn't share the bed with Rajat, sleeps on the floor instead)? What made him pass that derogatory remark? Elli should hit him for calling her 'Chammak Challo' and Armaan has to be the first contestant to be ousted from the show! I don't think it was armaan's fault..like Hazel said on Sunday that Kushal and Gauhar are really bitchy whereas armaan is a genuinely nice guy..yeah he is short-tempered but that doesn't mean he is bad by heart..and kushal and gauhar are too much..they are like this year's ashmit and veena.. It's hilarious the way they start playing the music in the morning in the Bigg Boss house. I mean who does that! And, surprisingly, the contestants start dancing the moment they leave their bed. This is one big happy, crazy family. Armaan is the big trouble-maker of the house. It's nearly impossible to cope up with his temper. The way he bullied Tanisha into withdrawing her vote was not a good sight. His fears are understandable but he needs to put his points with the right attitude. The new Bangladeshi model in the Bigg Boss house is likely to create a rift among the female members of the show. But, I was just wondering what would be Armaan Kohli's reaction to this guy? 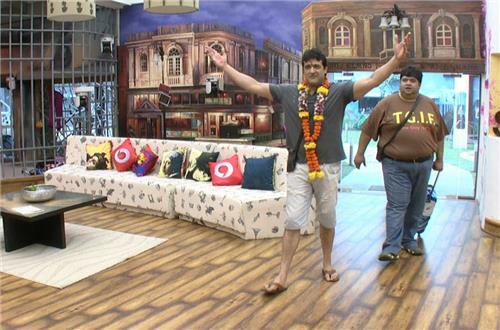 The way Asif Azim entered the house was quite funny, but will his stay at the house be even half funny? I guess Bigg Boss himself needs to do something new to involve this model into the daily routine of the house. Kamya has raised some important questions about the captaincy of the house. Does Tanisha deserve to be the captain of the hose for these many days. Salman Khan's jibe on Katrina Kaif was well timed though. Ok, so it's Rajat's turn to leave the house. Seems more action is awaiting the audience tomorrow. Stay tuned. on the other hand, Armaan has become a habitual trouble maker. He should change his ways otherwise this may hamper him in the longer run. What do you think? Also tell us, who is the most genuine contestant on the show? Is Anita Advani trying to gain sympathy from the viewers by talking about her bond with Rajesh Khanna and how she was treated post his death? This lady Anita, I don't know y she is here...n y is Armaan scared of her as he was lying to her about voting n the new guy y would u bring that guy I thought someone was bringing Pratyushas x..
Who is going to leave the Bigg Boss house tonight? Going by the current performances who seems to be the most vulnerable contestant? Is Salman right that the house is badly affected by the epidemic of love. At least, two love stories are running parallel to each other. Armaan Kohli getting into a spat with virtually everyone is now coming across as a strategy to hog the limelight. Why can’t he act like a mature person? Why does he have to stoop to the level of using cuss words to force his opinion on others? Armaan is getting good support inside and outside the house, and he is slowly emerging as a popular contestant. You can like him or hate him but you can't ignore him. Is Tanisha genuinely fond of Armaan? Why else do you think she has been fighting and rooting for him? Gauhar and Kushal cuddle each other and share some moments together. We don't mind, do you?